THIS is the bicentenary year of the Luddites in West Yorkshire. In 1812 parts of the West Riding saw major outbreaks of violence by people who have come to be known as Luddites. They were mainly croppers, a small and highly skilled group of cloth finishers, who, at a time of the worst trade depression since the 1760s, facing deepening poverty, rising wheat prices and food scarcity, turned their anger on to the new cropping machines, which they feared would put them out of work. In 1812 there were numerous attacks in and around Huddersfield, including an attack on Rawfolds Mill on April 11 and the ambush and murder of a mill owner, William Horsfall, on April 28. The violent events of 1812, leading to a string of executions at York, have been retold ever since by historians, novelists and playwrights. To mark the bicentenary the West Yorkshire Archive Service has produced a major display of historic documents and images, which look at various themes, including Luddite figures such as Benjamin Walker, the response to the unrest of local people in authority, and the suffering of the widows and children of Luddites. The display is at various venues during the year. It is currently at Halifax Central Library, where it will stay until May 10. In June it will be on show at King Cross library and in August at Todmorden. The archive service is part of the Luddite Link partnership which provides information and resources about the Luddite movement in West Yorkshire. 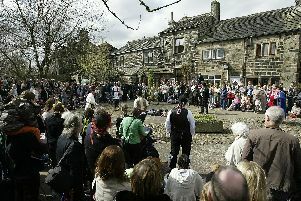 Throughout 2012 there will be commemorative events, including a day school organised by the University of Huddersfield with 10 speakers on a range of Luddite topics. Information about these activities can be found at ludditelink.org.uk/ and www.archives.wyjs.org.uk/. Graham Hebblethwaite, chief officer of West Yorkshire Joint Services, which oversees the archive service, said: “The West Yorkshire Archive Service is pleased to be working with the University of Huddersfield, Kirklees Museums and other partners in this major project which not only commemorates the Luddites but aims to promote and encourage discussion and research into their legacy. “The events of 1812 brought the West Riding into the national spotlight and it is said that at one time there were more troops sent to quell the Luddites than were fighting Napoleon on the Iberian Peninsula!